At the end of a meandering lane lies this rural cottage, quiet and serene, overlooking Grace Creek and P.T. Hambleton's--a crabbing operation that can offer you the bounty of their daily catch if you aren't lucky enough to catch your own. Priced for families looking for a traditional Eastern Shore cottage, this is a great home for an impromptu getaway. 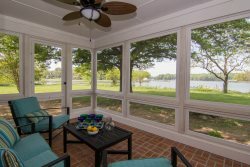 Located on the outskirts of St. Michaels, dining and shopping conveniences are close by. Our past guests tend to visit this house for crabbing, fishing and just getting away from it all! Water Toys Included: One (1) Canoe. To ensure proper sizing for your group, please bring your own life jackets, or we can recommend a rental agency. Fireplaces: Wood-burning. Firewood is not provided. WiFi: This property does not have internet.